We turned the spotlight on four more of our Festival alumni! 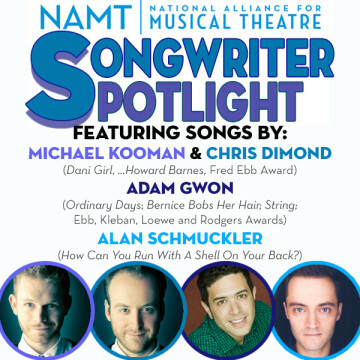 Adam Gwon (Ordinary Days- ’08; Bernice Bobs Her Hair– ’11; String- ’14; Ebb, Kleban, Loewe and Rodgers Awards), Michael Kooman & Chris Dimond (Dani Girl- ’11, The Noteworthy Life of Howard Barnes- ’14, Fred Ebb Award), and Alan Schmuckler (How Can You Run With a Shell On Your Back?- ’09) will share songs from their NAMT Festival shows and new projects, all sung by some of their Broadway pals. "I'm Not Funny" from HOW CAN YOU RUN WITH A SHELL ON YOUR BACK?